Dewey was purchased from a commercial pet store. He is a bearded dragon and we knew getting into his parentship that he would need a lot from us. To begin, Bearded Dragons have very special diet and enclosure needs. They eat a diet that consists of greens, like Collard Greens, and protein, which is similar to Dubia Roaches and/or Crickets. Their enclosure needs to be around 100 degrees in the warmest spot and about 80 degrees in a cooler area. They must have a UVB bulb (yes, those are the rays that hurt humans but are essential to Dragons), and a basking bulb where they can warm their bodies up. 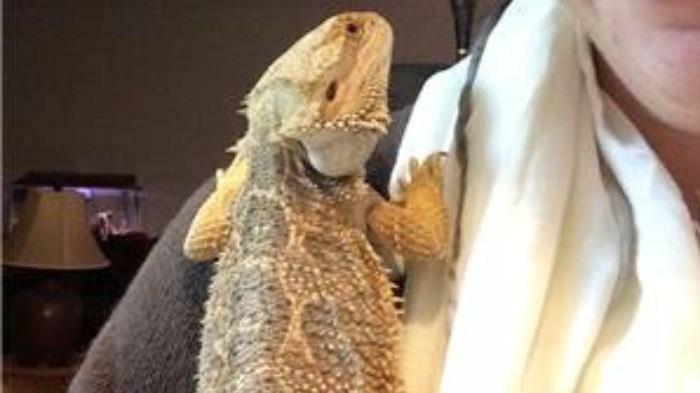 Bearded Dragons are cold-blooded and that's why this is so important. They require a bath a few times a week so their skin in healthy and sheds easily and it also gives them an opportunity to drink if they wish. They should be handled frequently when they are young. This builds trust in them being handled by their owners and also helps you learn their body language so when they grow larger you aren't afraid of them. Owning a Bearded Dragon has been an awesome experience. You learn so much about how to read these guys because they make no sounds. They can't whine or meow or growl at you. You have to know what they need based on how they look, what they are acting like, or what they aren't doing naturally. Initially, these guys are expensive for all of the right equipment, but soon after you will get into a groove and only need to make a few changes over the years. I love Dewey and I would recommend a Bearded Dragon to those who aren't ready to commit to a larger animal yet. He is a great starter for kids to help teach responsibility as long as there is good parental guidance and support.